Scott's of Wisconsin is all about cheese and dairy products. We truly believe in doing more, delivering more so that you have more to love. This is the underlying current of who we are, what we do and what we give to you each and every day. But there is more to know about Scott's, our phenomenal products and our rich Wisconsin farming history. Scott's of Wisconsin was started more than 30 years ago with an eye toward producing cheese and dairy products that are worthy of the state of Wisconsin's long tradition of excellence in this field. In 2011 the company was acquired by the Knaus Family, a family on its fourth generation in the cheese industry; that's more than 100 years experience. Our family owns and operates both Scott's of Wisconsin and Weyauwega Cheese to give you a broad range of Wisconsin cheeses for all of your needs, from individuals to company requests. We are very grateful to be able to do what we love and to continue our family legacy. We know that we owe a great deal of our success to our loyal customers and we strive every day to let you know how much your business is valued. The short story is that we manufacture high quality cheese spreads; both cold pack and processed cheeses. The longer version begins more than 100 years ago when our family started making cheeses with the highest quality products, we have always taken great pride in. Today we continue that tradition. To us, making cheese isn't just a business, it's our family legacy and just as we inherited it we want to be able to pass it down to future generations. Deep in the heart of Wisconsin you'll find Scott's of Wisconsin. We are a Wisconsin family and business, producing Real Wisconsin Cheese. Our facility is located just outside of the capital city of Madison in Sun Prairie. Scott's of Wisconsin opened in 1979. In 2011 the Knaus Family assumed ownership, a family that started in the Wisconsin cheese industry more than 100 years ago. Our very first production date under the new ownership was April 4th of 2011. 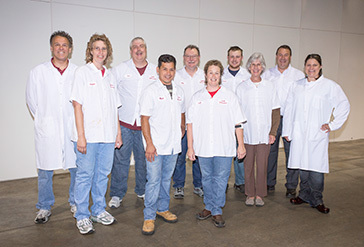 Scott's of Wisconsin has earned a great reputation in the Wisconsin cheese industry for the high quality cheeses we produce, our focus on customer care, our commitment to going above and beyond to meet your needs and create custom orders. We deliver all of this at competitively priced rates. Our honest desire to serve our customers is all inclusive. We are a company that is small enough to support the one store customer and big enough to provide a multi-level food network. We are also tied to our sister company, Weyauwega Cheese, which means you have access to our wide berth of Real Wisconsin Cheeses.